I wonder if anyone has any information or photos of my grandparents David and Elisabeth (Bessie) Applegarth, that owned Cape House Farm on the hill alongside the viaduct until it was destryoed by fire the year that I was born, 1974. Any information would be greatly appreciated. My mother is Rosemary Applegarth and my Aunty, Marion Applegarth also lived there. For those Forum readers that may not have heard of Cape House Farm before it was a substantial building that stood to the east of the old Carlton (later re-named as Redmarshall) Station. Strictly speaking this location is not in Grindon Parish but in Redmarshall Parish. It lies mid way between Thorpe Thewles and Carlton. However, historically the small community that lived there (railway, agricultural plus chemical plant workers) appear to have had a closer affinity to Thorpe Township. This is echoed by the fact that Sgt. John Bee, a resident of the hamlet who were killed in the Great War is commemorated on the Grindon Parish roll of honour in St. James’ Church, Thorpe Thewles, in addition to his name appearing on the Carlton War Memorial. 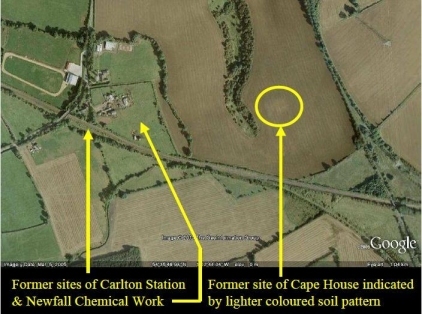 On the Google Earth image below (dated December 2005) the former site of Cape House can just be made out in the form of a rectangular patch of lighter coloured earth in the ploughed field adjacent to the former site of Newfall Chemical (Tar) Works. 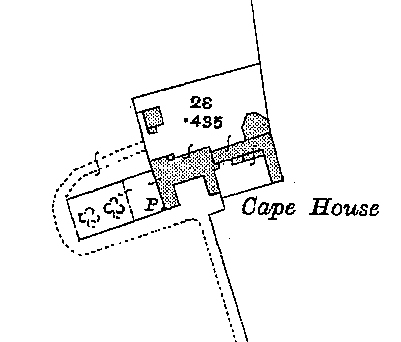 The image below, showing the outline layout of Cape House, is taken from a map of 1918/19. This date corresponds with the final dismantling of much of the old Newfall Chemical Works, which ceased production at the start of the Great War.